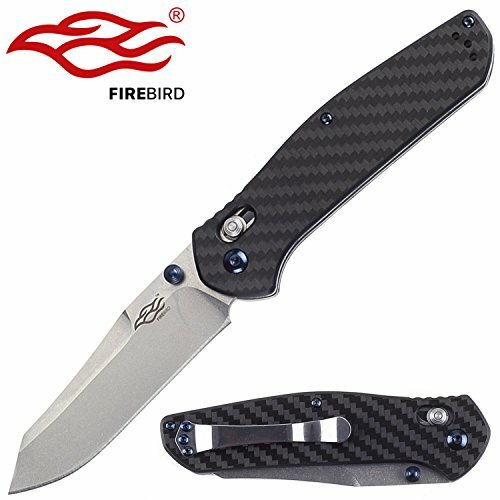 Firebird Knife F7562 by Ganzo G7562 Pocket Folding Hunting Knife Carbon Handle SS Blade by Firebird at Freedom from Government. MPN: F7562-CF. Hurry! Limited time offer. Offer valid only while supplies last. Black blade color makes this knife very stylish and also helps to avoid adverse external factors. High-quality hard steel 440C is used for F7562-CF. Black blade color makes this knife very stylish and also helps to avoid adverse external factors. High-quality hard steel 440C is used for F7562-CF. This steel type is resistant to corrosion and keeps sharpening for a long time. The handle of F7562-CF is made of carbon fibers. F7562 is a practical knife and fits for tourists, fans of extreme sports and other nature enthusiasts. This model is designed for everyday carry and outdoor using. If you have any questions about this product by Firebird, contact us by completing and submitting the form below. If you are looking for a specif part number, please include it with your message.